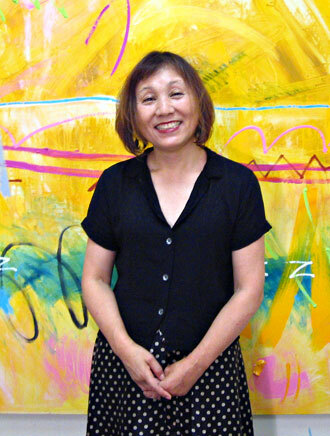 Kazuyo was born in Japan and came to America to find out about America and herself. She enrolled to the Art Institute in 1976 to study art. At the Art Institute, she studied American Abstract Expressionism, influenced by Hassel Smith, Tom Holland and Sam Tchakalian. After studying at the Art Institute for eight years, she emerged as a painter with a unique style of abstraction embodying Eastern and Western heritage. Her act of painting is an adventure into unmapped territory. Crawling into the earth or flying into the sky she empties herself out to channel the energy that drives all creation. Guided by intuition, she paints what is in that space; it is "a song or dance" made by her hands. Her paintings are created in the space where songs are created and where life is created. The joy present in her paintings is the joy of life recognizing and celebrating its existence. Although she is drawn to some metaphoric images from time to time, her focus is not in the representative world we inhabit. Nor is her focus on an imaginary world, or a dream world. Her expression taps into what exists before language or representation, before emotion or thought. Using the technique of American Abstract expressionism she captures pieces from this world of raw creation and places them onto the canvas, where they retain their power and life. She believes that the essence of the performance and installation art movement developed from American Abstract Expression; spontaneity, even accidents, are an expression of life in progress. She does not deliberately design, adding a dash of color here, or removing a symbol there, because the painting itself would cease to be complete and alive, and instead be just a narrow expression of an individual artist. Each work instead expresses all of life, just as it is, making every stroke and patch essential; each element expresses the whole of the painting, just like a person’s individual thoughts and actions express and create their whole life and being. Removing her ego and expectations from the process, she endures for her paintings to emerge living from her canvas after many blood shedding attempts. Today, Kazuyo lives works and lives in Oakland.